First, welcome to Barry Barnitz’s new investing blog, Financial Page. If you are a new investor in index funds, here is some information to think about. 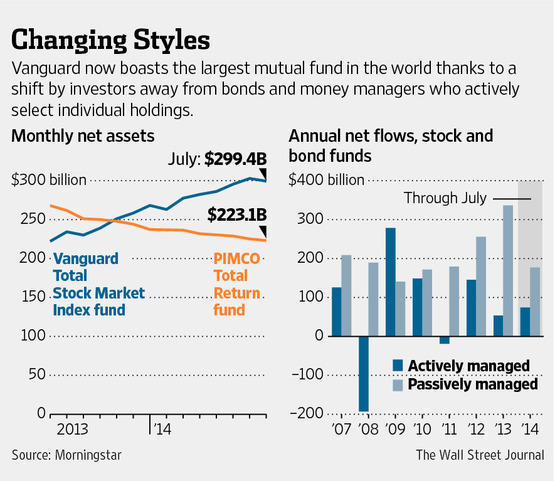 Inflows into mutual funds, and particularly index funds, has been very strong over the past three years. Fund flows are driven by investor behavior, and this particular behavior is the dogged tendency of investors to move in and out of stocks with market returns, thus creating the flow. The behavior is referred to as performance chasing. And it’s not just by year, it even happens on a weekly basis. Frequent evaluation of the market and the portfolio tends to cause investors to shift to more conservative allocations as it increases the chances of seeing and reacting to losses, even minor ones. This behavior is called myopic loss aversion and it is shown in the weekly Lipper data reports. Note that investor fund flows always lag fund performance by some time period. It can be very short for those watching their portfolio on a weekly or monthly basis. The weekly flows can be matched to ultra-short term fund movement as evidenced by this Morningstar chart: Vanguard Total Stock Mkt Idx Inv (click on link to view). Performance chasing is one of the most prevalent and damaging behaviors investor can engage in. It’s the primary reason investors do not capture the returns their funds generate. It easily wipes out all advantages of using index funds. Performance chasing is common with undisciplined investors using active funds because they are seeking out-performance, and they are quick to move if the performance isn’t there. It’s interesting to note too that generally the more volatile a fund is, the more nervous the investor is, and the lower the investor returns. S&P did a study in June, 2014, Does Past Performance Matter? The Persistence Scoreboard, (available for download at S&P Dow Jones Indices) in which S&P found the persistence of top performing mutual funds to stay on top has been absolutely dismal in recent times. This kind of performance is a major reason investors go looking for something better. Dunn’s Law applies to asset classes as well as the S&P500 and total market and it’s now in full force. New indexers have picked up on the performance of large cap index funds and they are jumping in. This is a dangerous move for new indexers who do not fully understand why index funds outperform in the long term. And it gets worse: we are also seeing posters on the popular Bogleheads forum shifting to more aggressive asset allocations, and they are also getting more aggressive in their rationale for higher risk. Short term index outperformance is unusual and meaningless. In their paper, Mutual Fund Flows and Performance in Rational Markets, Burk and Green demonstrate why past performance is not a usable tool in fund selection or asset allocation. We are seeing large cap indexes outperforming as Dunn’s Law predicts, and one of the reasons is index funds are full strength—they don’t hold cash waiting for a perceived opportunity. This also means that when a market drawdown occurs, they again receive the full-strength effect, with no cash buffer on the downside. For the new index investor with little understanding, it results in a bail out. Again, this is a trap that locks in losses. New indexers should take the time to evaluate their investing strategy, develop an investment policy statement and fully understand what indexing is all about and why it’s a superior strategy in the long term. Short term performance, while sometimes attractive, will disappoint. A good source of basic information can be found in the Bogleheads’ Wiki.